Honorable mention: John "Hot Plate" Williams, "The General" (Bob Knight), "The Big Dipper" (Wilt Chamberlain), David "Skywalker" Thompson, "The Glove" (Gary Payton), Earl "The Pearl" Monroe, Herman "The Helicopter" Knowings, "The Owl Without a Vowel" (Bill Mlkvy), "The Dunkin' Dutchman" (Rik Smits), "The Answer" (Allen Iverson), "Dollar" Bill Bradley, "The Big O" (Oscar Robertson). On Wednesday, Page 2 ran its list of the best nickname of all-time in men's basketball. We asked for your take, and you filled our mailbag with plenty of opinions. First of all, without any association to Earvin Johnson, the nickname Magic is still a great nickname. In terms of basketball, this nickname conveys a sort of "wizardry" on the court, i.e., the nickname holder does things in the game of basketball that have never been seen before, that strain the imagination, that may inspire mimicking and that may never be duplicated. 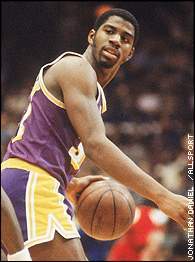 Secondly, now associating the nickname Magic with Earvin Johnson, the nickname permeated Johnson's life, in the sense that only his immediate family (I'm making an assumption here) refers to him as Earvin, to the rest of the world he is simply Magic; that, in a sense, makes the nickname Magic timeless. To me when a nickname has both of those qualities, the essential qualities of a good nickname along with an ageless component, it exceeds all other nicknames and should be revered as ... Magic. Rarely does an individual's true first name virtually disappear from existence because a nickname fits so well, but Magic just seems like what his mother should have put on his birth certificate. Magic exemplifies not only Johnson's game, but his personality as well. One word says it all: "Magic." This man was just an amazing scorer -- he could put it in the hoop from anywhere on the court. Remember the Eastern Conference finals game against the Celtics? When he got airborne you had better watch out. The dunk contests he had with Jordan were what made it popular, and their 1988 encounter was by far the best of all-time. Anyway, the nickname "The Human Highlight reel" could not be given to a better player. I cannot believe this did not even make honorable mention. Are you trying to tell me "The Dunkin' Dutchman" is better? Please. There isn't a player who's more a personification of his nickname than 'Nique. He was a windmill-dunk-in-some-clown's-grill waiting to happen. He gets no respect; they didn't put him on the NBA's Top 50 players of all-time list, and he can't even get on the a best nickname list? He's always denied. No respect. Ridiculous. Off the Bad Boys teams of the late 1980s-early '90s Detroit Pistons, Vinnie Johnson had the coolest nickname of all, by far. A sixth man who could come off the bench and "heat up" in seconds, he became the embodiment of timely clutch play for the Pistons, although he had to always reside behind some of the other big names on the team, such as Isiah Thomas, Bill Laimbeer, Joe Dumars, John Salley, and Dennis Rodman (not to mention coach Chuck Daly). Give the guy his due now: There aren't too many nicknames more unusual or more fitting for anybody than that of the Microwave himself. Not only was it clever ("he heats up in a hurry"), but it was also proven to be true time and time again, often in the most crucial of playoff situations, where he'd step off the bench and light up double digits before the next commercial break. My choice for the best basketball nickname is the Round Mound of Rebound, a very fitting nickname for the great Mr. Charles Barkley. One poetic phrase to describe his physical and on-court presence and a funny expression to describe a funny guy! Here we have a big man that dominated on both sides of the court with a combination of power and finesse. He is the all-time leader in blocked shots and the creator of one of the most prolific shots in NBA history. Show me another center that can consistently knock down 15-foot fallaway jumpers and then run the court, bang in the low post, and make his opponent look like a fool when his shot is 12 rows in the stands; and do it all with a smile on his face. "The Doctor" because it was a nickname given to him by an old high school friend of his and it stuck with him throughout his entire college and professional careers. It symbolized what he was on the b-ball court: a surgeon who operated with unmatched precision and professionalism. Air Jordan was always clear for takeoff. It's the greatest nickname in sports. Hardly anyone who doesn't closely follow the history of the NBA would know "The Human Eraser," "The Wizard of Westwood" or "Dr. Dunkenstein." But say Air Jordan, and there's not a soul alive who doesn't know who you're referring to. This by far is the best name because Allen Iverson was the answer to all of the Sixers' questions. Questions like; When are we going to be good again? When will we have another MVP? When will we win another championship? Well, Allen Iverson is The Answer to those questions and many more to come, because he plays with heart and talent. This is one of the harder choices your readers' polls have presented. I grew up in Minnesota without pro hoops, so I latched on to national stars. Dr. J and Magic were better ballplayers. Pistol Pete could flat out score. 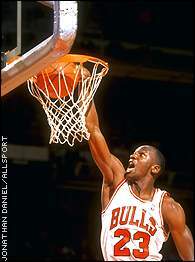 And Michael will always be his Airness. But for pure basketball names, the one I could never shake was the Iceman. I looked for his stats before any others in the morning paper. I had to wait a few years to use his name when we played on the local courts because my older neighbor had already claimed "The Iceman" as his own. The Iceman cometh and the Iceman goeth, but the nickname "the Iceman" will forever stayeth. Because from the first moment you saw him you knew you were watching history being made even on the storied history of Boston's parqueed floor and you knew that you'd be telling your grandkids about this Legend for decades to come.